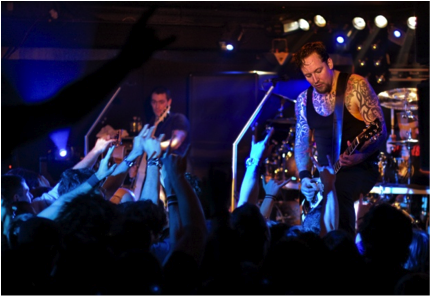 Volbeat are a phenomenon that haven’t quite caught on in the UK. Whilst in mainland Europe they headline arenas and festivals, tonight the Danish metal/rockabilly behemoths playing the ABC to a sold out crowd of less than 2000 people. Opening with the double whammy of ‘Hallelujah Goat’ and ‘Guitar Gangsters & Cadillac Blood’, it becomes clear that the band is unfazed by the size of the venue. Michael Poulson and co are on blistering form tonight, and the crowd greets both the old and new songs with an equal level of bedlam. Country- metal hybrid ‘Sad Man’s Tongue’ (preceded by a cover of Johnny Cash’s ‘Ring of Fire’, naturally) and recent single ‘Lola Montez’ incite absolute bedlam in the crowd, while slower songs such as ‘Heaven Nor Hell’ and ‘Fallen’ inspire mass sing-a-longs. What really shines through during the show is not only the quality of the songs, but also the quality of the musicians behind them: frontman Poulsen delivers his Elvis-meets-James Hetfield voice with incredible power, the long-time rhythm section of Anders Kjølholm and Jon Larsen don’t miss a single beat, and newcomer Rob Caggiano (formerly of thrash metal titans Anthrax) seals his reputation as one of the best guitarists out there. The main set finishes with a frighteningly good version of ‘Maybellene I Hoftehodler’, the Metallica like ‘Hangman’s Body Count’ (which follows a jam session of various songs that include Rammstein’s ‘Keine Lust’, Slayer’s ‘Raining Blood’ and Deep Purple’s ‘Black Night’) and the reggae fuelled ‘Still Counting’. The momentum hasn’t let up for a good 90 minutes by this point, surely the band will tone it down a notch for the encore. Toning it down, it seems, isn’t part of Volbeat’s vocabulary, with the encore consisting of ‘Doc Holliday’(like Slayer with banjos), a cover of Dusty Springfield’s ‘I Only Wanna Be With You’ (no, seriously) and the triumphant climax of the fantastically titled ‘Pool of Booze, Booze, Booza’.